"Thank you so very much Mark. 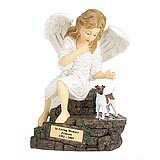 We did receive our urn and Sassy has been placed inside it. It is abosolutely beautiful! 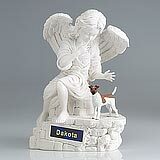 We have her in the Family room on one of our tables so she is still with us. 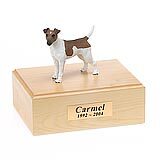 I have passed your name onto my Vet for another family who may decide to keep their loved one with them. Could you possibly send them some of your pamphlets so they have some. Thank you so much for everything during this difficult time. " 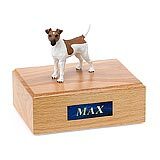 All available Fox Terrier dog urns and memorials will be displayed with the figurine on the Fox Terrier urn you select and in the appropriate size.